New York, N.Y. Delhi-born, New York City-raised jewelry and accessories designer extraordinaire, Amrita Singh, is part of an elite group of 30 fashion designers, including Diane von Furstenberg, Prabal Gurung, Isaac Mizrahi, Nanette Lopez, Elie Tahari, Rebecca Taylor, and more, invited to “trick out” their own two-wheeler bicycle for the ‘Tour de Fashion: Bike-Sharing Program,’ running September 8-15, 2011.
the ‘Tour de Fashion: Bike-Sharing Program’ in New York City. Photo: Nan Melville. 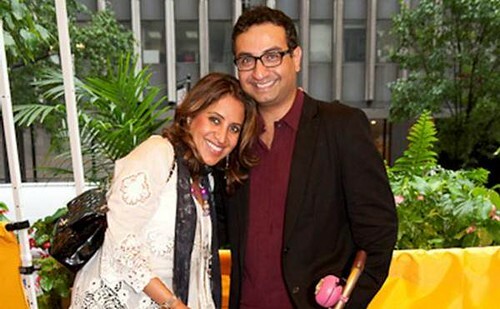 The beautiful Amrita Singh with Jitin Hingorani of JINGO Media. 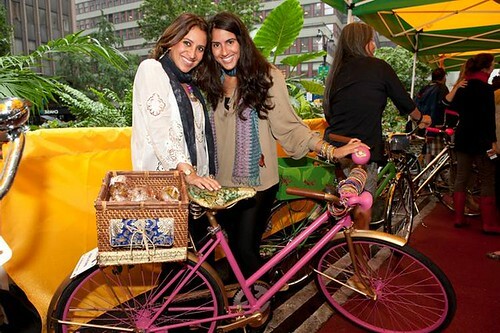 Tour de Fashion was created by the Fashion Center Business Improvement District (BID) in an effort to highlight New York City’s legendary Fashion District as the birthplace and epicenter of American fashion. “During Fashion Week, all eyes are on New York City, and there is no more appropriate occasion to highlight the wealth of talent and history we have right here in this neighborhood,” says Barbara Randall, president of the Fashion Center BID. Amrita Singh with sales executive Leron Elkharrat. Photo: Nan Melville. The bicycles will be available free of charge, with a valid credit card and driver license, at staffed stations on several of the plazas along Broadway. 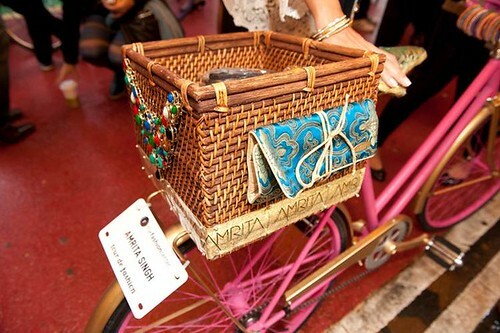 Amrita Singh’s staff will be giving away goodie bags filled with jewelry the entire week of September 8-15 to everyone who rides her bicycle. Launched in January 2003, Amrita Singh designs have won the admiration and devotion of the fashion world, celebrities, and the everyday woman. Her unique blend of Old and New Worlds into exuberant and artistic pieces of fashion jewelry and accessories have won her accolades in the fashion industry. 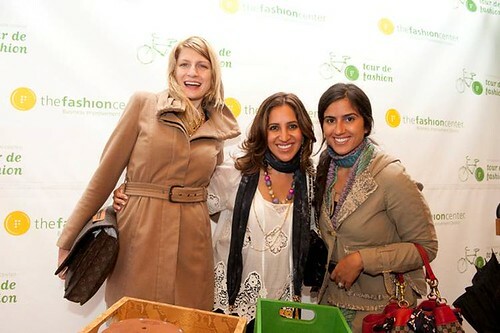 Fashion designer Amrita Singh at Tour de fashion. Photo: Nan Melville. Her line for the Contemporary Woman, featuring the popular Bangle Bangle Collection as well as the Bollywood Collection, are available online and at several top American stores, such as Neiman Marcus, Nordstrom, Macy’s, Intermix, Holt Renfrew, and various other boutiques and stores in the country. The Contemporary collection has recently added other accessories, such as handbags, sandals, and hair accessories. These accessories continue the company’s tradition of high quality, creative, and fashion-forward designs that Amrita Singh Jewelry is renowned for. Amrita Singh with marketing manager Kirby Fowle and Leron Elkharrat. Photo: Nan Melville. The Fashion Center Business Improvement District (site) is a not-for-profit corporation established in 1993 to improve the quality of life and economic vitality of Manhattan’s Fashion District. Through programs in the areas of streetscape improvements, sanitation and public safety services, marketing and promotions, economic development, and community service, efforts are aimed at promoting the district as a strategic midtown business location and ensuring New York’s position as the fashion capital of the world.